There are several questions surrounding Titanfall 2 and Respawn's first foray into a solo campaign. Shacknews recently spoke to game director Steve Fukuda about the game's story, building a relationship between man and machine, and trying to stand out from the FPS crowd. Upon first glance, Titanfall 2's single-player campaign would appear to be something similar to most other solo efforts in this same type of game. Take control of a soldier with a gun and try to blow away as many bad guys as possible, right? While that can be the case in parts of the story, the overall idea seems to be Respawn attempting to tell a more unique tale. A low-ranking soldier has been thrust into a greater role, one that involves taking his fallen commanding officer's giant mech and neurally linking to it. 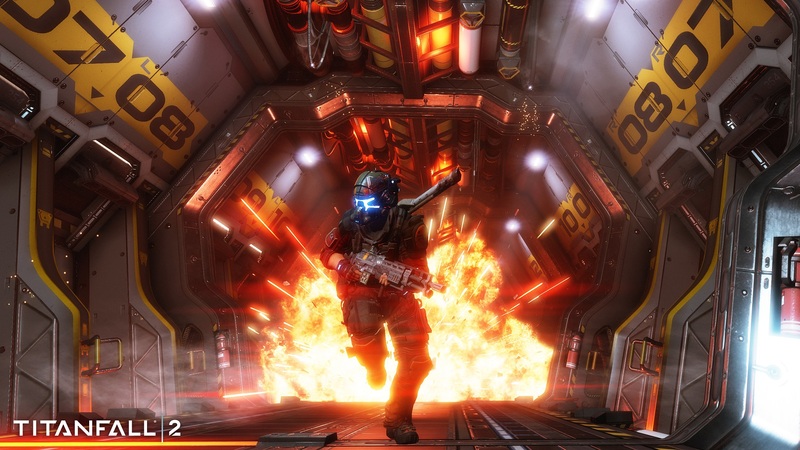 As discussed last week, Titanfall 2's story is a tale of a man and his machine. For Respawn, it's also an attempt to make good on one of the previous game's major criticisms: the lack of a compelling solo mode. To learn more about this story of a man and his mech, Shacknews spoke to game director Steve Fukuda. Shacknews: What were your main goals in designing the Titanfall 2 campaign? Steve Fukuda, Game Director: One of the main goals was, let's try to find a way for players to learn the mobility of Titanfall. That's a pretty distinguishing characteristic of how to play Titanfall and that's a key element. Another goal is, of course, to create a relatable and memorable kind of narrative experience for players who know nothing about Titanfall or its universe. So we've got players coming in on a new platform (PlayStation 4) and part of that is saying, "A lot of people don't know how to play Titanfall. Let's cast a character of sorts that is parallel to that player's experience." That is to say Jack Cooper is a rifleman and somebody that's probably played other shooters, if you will. But this is a player that doesn't know the full freedom and range of what you can do in Titanfall. That's the part of creating that dynamic of, here's your new fight with this robot buddy who's very experienced and how do those two work together? How do they get better and better together as they go forward in their adventure? Shacknews: What makes Titanfall 2's campaign stand out from other solo campaigns in this genre? Shacknews: Like mastering that fluidity of movement? Fukuda: Right! And that fluidity of chaining your actions together. Making interesting choices along the way encourages you to express yourself in terms of action. It's not a particularly repetitive kind of game. It's very up and down, with different situations and different configurations of geometry and the experience that you go through. It's not a "one mode" experience. Shacknews: How important is it for you to communicate that relationship between the Pilot and the Titan? Fukuda: It's essential. One of the questions we asked ourselves is, "What is the essential core of this game, thematically?" We have multiplayer, where you have a Pilot and a Titan. A lot of people say that it's cool that you get to play as an agile Pilot and a durable robot. That seems to be the essence, but how do you translate that to a single-player mode, to an experience that I can play by myself without these other players attacking me? It seemed clear to us that the buddy story is the essence. If you turn it into a narrative, these are buddies. Do they know each other at the beginning? Do they not know each other? Now we can explore down the path of, what is a buddy story? Shacknews: With that said, what went behind the decision to use dialogue options over the course of the campaign? Fukuda: One thing we realized was that, in a buddy story or a love story (which a buddy story is, basically), it very rarely works when communication is one way. And the more we worked on the game, we discovered moments where we instinctively replied to the Titan when he asked us a question, like "Are you alright?" That's kind of where it started. "Hey, let's let the player talk to the Titan, just on a purely personal kind of dialogue level." Allow the player to pick the one attitude that matches what they're feeling at the time and lets them respond reflexively and intuitively with the Titan. I think that helps the bond and makes the Titan a more real character. Shacknews: There's so much emphasis on that relationship between the Pilot and the Titan. Since I'm building up each of those characters from scratch, there's going to be that temptation and that desire to bring that particular Pilot and that particular Titan into multiplayer with me. Has any thought been given to allowing for those single-player characters to cross over into multiplayer? Fukuda: There's definitely been a lot of conversation. We haven't decided anything yet. There are differences between how BT is physically constructed, as well, compared to the six Titans available in multiplayer. There are technical differences there that have to be overcome. But I am kind of curious to see if there's a response, if people ask "Well, where is he in multiplayer?" It'd be a great question to be asked. That concludes our talk about the Titanfall 2 campaign, but there are still questions to be asked about the game's multiplayer. Questions about Respawn working with player feedback, new features, the question of dwindling player bases, and more. Come back to Shacknews tomorrow for part two of our chat with game director Steve Fukuda.